An architect is different from others. He looks perfection and design in all things. 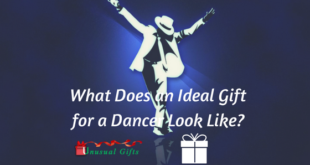 It is easy to decide on a gift for your friend. But if you are trying to list out presents for architects you have to put some thought into it. Here are some gift ideas for architects. The first gift item in my list of gifts for an architect is a paperweight. The paperweight in the link is made from an architect’s blueprint. The design is printed on a paper and is hand crumbled. Then, it is wrapped around a steel structure to make it a paperweight. We know that an architect will have a bunch of papers on his desk, so paperweight is a must. Architects will be spending most of the time in front of their desks working on models. Most of us have a hobby of sipping coffee while working or reading. 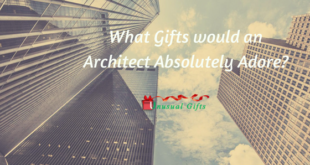 So why don’t you gift him an architecture mug as a gift. 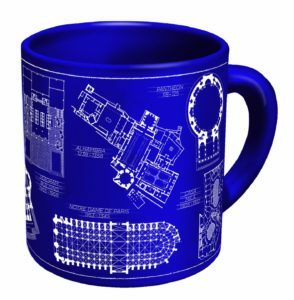 The mug in the link has architectural drawing of 10 famous constructions printed on the mug. 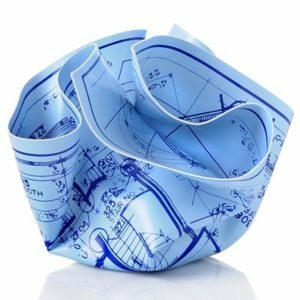 If you are looking for unusual gifts for an architect, this is a great choice. If you are searching for gift ideas for architects, you can gift a personalized t-shirt with a message about architecture. This t-shirt is made from cotton and is lightweight. 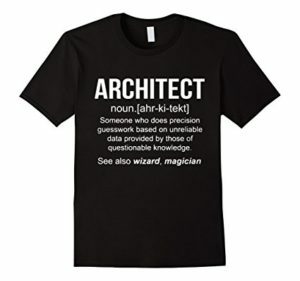 The t-shirt has a funny message (architect defined in a funny way) printed on it. The product in the link is just an example. If you search, you will get different t-shirt models. You can even buy a plain t-shirt and personalize it with your message. 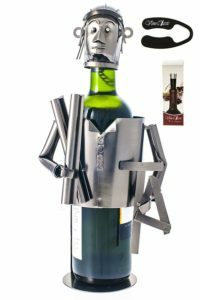 If the architect you know is a fan of wines you can gift him this wine bottle holder as one of the presents for architects. The wine bottle holder is in the shape of an architect. The architect figurine is holding blueprints and geometric rulers with a cap on his head. A 750 ml wine bottle fits perfectly in this holder. As a compliment, the seller offers a wine vacuum stopper and foil cutter along with the product. Next gift item in the list of unusual gifts for an architect is a tech-tool pen. This sleek and stylish pen is not just used for writing. It can also be used as a screwdriver, spirit level, and a ruler. You just have to twist the gripper to write and the screwdriver can be revealed by removing the cap. You can just reverse and replace the screwdriver nib to use the other screwdriver. Spirit level is also available with this pen. 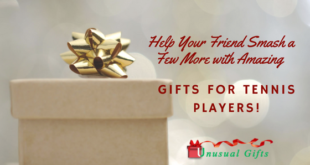 Your friend is going to love this simple gift from you. Next, I am referring a tool that is commonly used by architects, a sale tape. 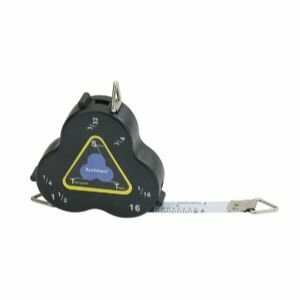 This 2 feet long tape can be used to measure partial radiuses also. 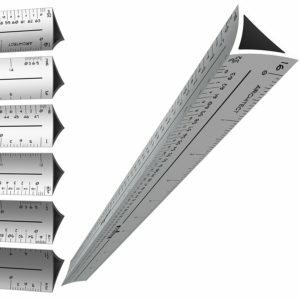 This triangular scale tape is a complete set of conversion scales that is useful for architects and engineers. Because of its compact design you can carry this in your pocket. This scale tape will definitely feature in the list of presents for architects. Well, watch has always been considered among the gift ideas for architects. 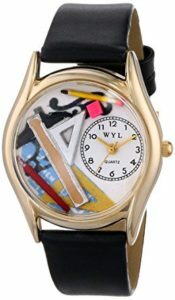 A leather watch with architect themed dial is one of the unusual gifts for an architect. The black strap is made of leather and the dial case is made of gold tone stainless steel. The architect themed dial has replicas of pen, pencil, ruler, geometrical ruler, and eraser. 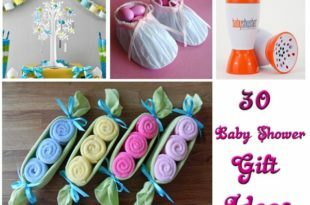 I am sure your friend is going to speak about this beautiful gift for a long time. 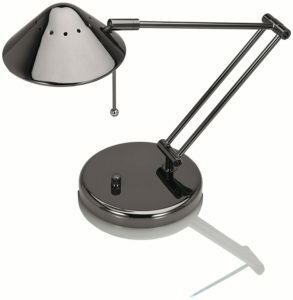 Next one in my list of presents for architects is a desk lamp. An architect always needs a desk lamp to precisely draw the blueprints. You can help him by gifting a desk lamp that has an adjustable arm (3 point). This 15-inch desk lamp has two light modes – high and low. The pack comes with a halogen bulb. Buy one and wrap it properly before gifting this to the architect you know. Next one is an item of fashion – a pendant in the shape of scissors. Just like the other tools scissors are also important for an architect. So I included this pendant in the list of gifts for an architect. 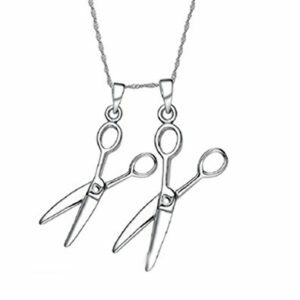 The chain in the link has two alloy-made replicas of scissors as pendant. Anyone can wear this to a party or function. The chain is available in different lengths for male and female architects. If you are looking for the perfect gift for your engineer friend, then without a doubt, the drafting scale makes up the perfect scale. Aluminum is the base metal. Thus, it has a sturdy body compared to the regular plastic ones that are found in the market; these scales are built to last a lifetime. Well, books are always the source of knowledge and from this book the architect can learn a lot. The book is about 50 buildings and their architectural structure. The author has tried to bring the contemporary culture and architecture to the public through this book. The book includes details about famous buildings like Rockefeller Center (New York), Selfridges (Birmingham), Villa Savoye (Poissy), and may more. 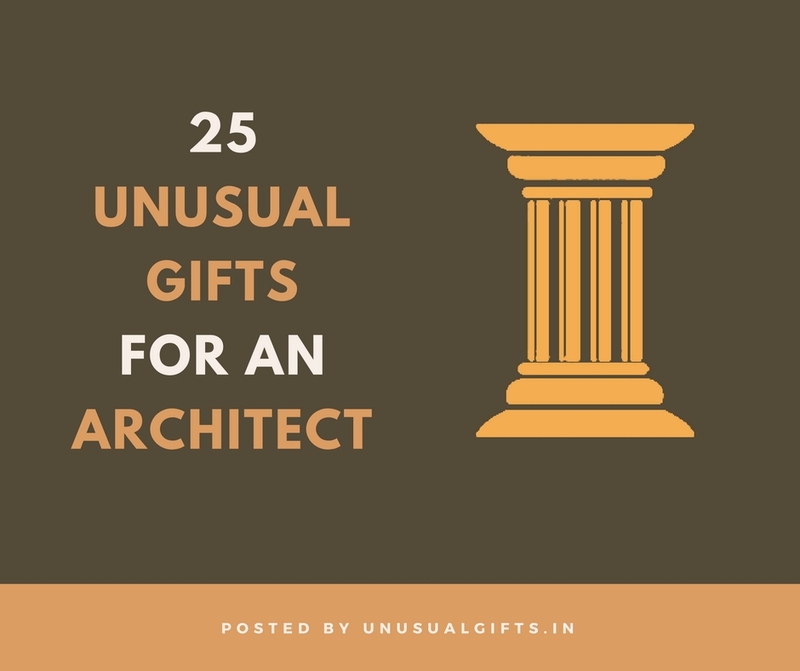 Do not think twice if you are searching for gift ideas for architects. 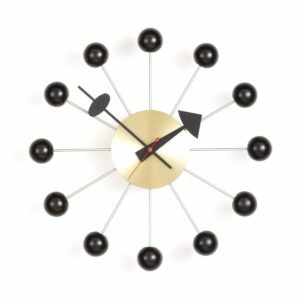 Clock has been considered as a safe gift choice for long time and here I am going to include a wall clock to my list of unusual gifts for an architect. The wall clock in the link is made from metal and beech wood (for the 12 digits). This innovative design represents the atomic structure because of the ball and stick design. This concept was implemented first by George Nelson and your architect friend is going to love it. Next in the list I have added one of the simple yet unique presents for architects – a concrete block magnet. This magnet is in the shape of a cinder block. The magnet in the link can be even used as a refrigerator magnet. The architect can stick a message on any metal surface using this concrete made magnet. The pack comes with 4 magnets and if you need more magnets you can order the set of 20. An architect’s desk will be messy with all architectural tools like pen, pencil, eraser, clips etc. 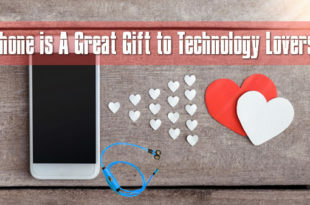 All these tools are necessary to complete a project perfectly. To help him organize his desk you can gift a desktop organizer set. The organizer in the link is in the shape of a miniature city and is made of porcelain. This organizer will definitely feature in the list of gifts for an architect. The next item in the list of unusual gifts for an architect is a gift that helps the architect to stay hydrated. 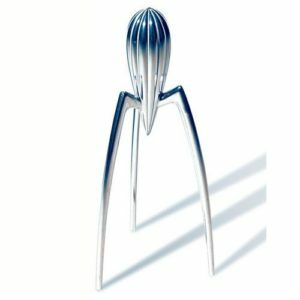 A citrus squeezer that looks like an alien warship is a great choice as a gift. The juicer has three legs and the top part can be used to squeeze out the juice. You can place a glass below the three legs to collect the juice. This juicer will always encourage the architect to invent something different. 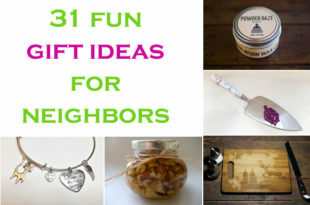 When you search for gift ideas for architects you will always consider the person’s hobby also. An architect may have hobbies like reading, fishing, gardening etc. 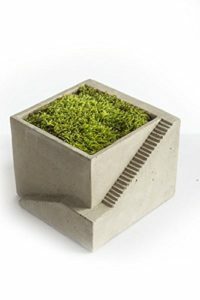 The next gift in the list of presents for architects is a cement planter that features a staircase also. The planter in the link has a vintage look and is perfect for an architect who has hardening as hobby. An architect will be interested in anything that is perfect in architecture and structure. 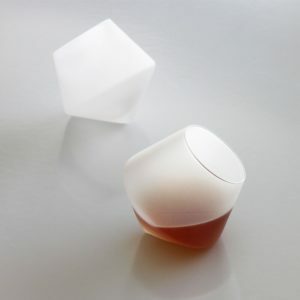 I have added these liquor glasses as the gifts for an architect because of the same reason. If you see in the link the glass is in the shape of a pentagon if looked from outside. Since the glasses are made stemless, the swirling movement (when you set the glass down) of the glass will mix the drinks very well. Now your architect friend can enjoy his favorite drink perfectly mixed. Next one in the list of presents for architects is a chess board. This chess board which was originally designed by Josef Hartwig does not use figures. Wood symbols are used based on the role of the figures and are used to play the game. Maple wood is used to make the board and the symbols. Shapes like cubes, spheres, and cylinders are used to depict the figures of the normal chess board. The pack comes with a wooden slide box to keep them. 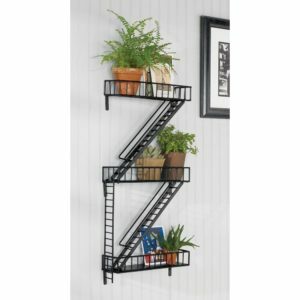 While searching for unusual gifts for an architect I stumbled up on a bookshelf that is in the shape of a fire escape shelf. The shelf in the link is made of epoxy coated steel. The pack comes with the accessories needed to fix it on the wall. Your architect friend can keep candles, potted plants, and books on this shelf. A fire escape staircase is a classic architectural part of building in cities. We have already seen a book about the 50 buildings that are masterpieces. 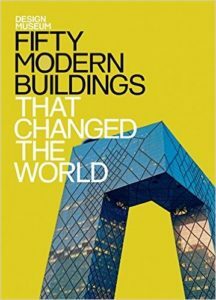 Next, in the list of gift ideas for architects is a book about famous architects who have created masterpieces. The book in the link is almost like a diary but the story is depicted in a different way. The stories are told through drawings and notes. 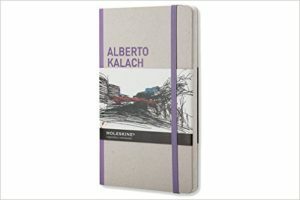 The book that I have mentioned here is about the life of Alberto Kalach. You can select the architect you want and order for your friend. 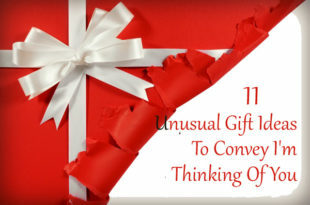 The next gift is for a budding architect who likes to experiment with structures. 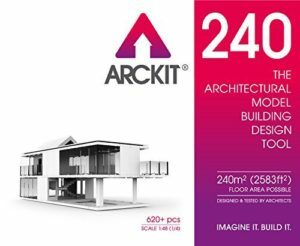 In the presents for architects I have added this kit so that the beginner can learn about architectural structures. Each box has 620+ pieces and adhesive sheets with manual on how to build the miniatures. 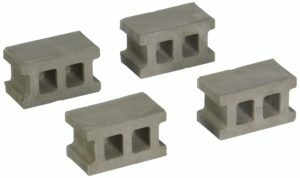 These pieces are reusable, so you can try different structures. The techniques used are contemporary and glue is not needed to make these miniatures. A 3D printer has become a necessity for architects to create perfect structures. 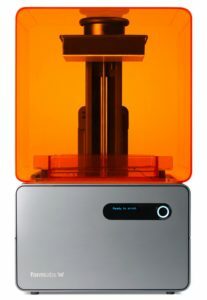 Let me warn you, the 3D printer is relatively costly because the print has to be in 3D form. For example, we know that the 3D print of an animal will exactly look like the animal in a miniature form. It will not be a photo of the animal. If you have the budget this is one of the wonderful gift ideas for architects. Next gift in the list of gifts for an architect is a landmark model kits that can be assembled by the architect. 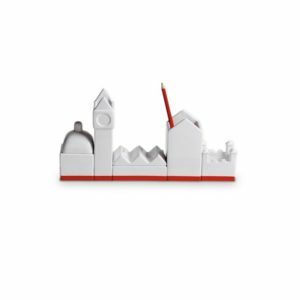 The kit contains the parts for the miniature version of iconic architectural structures around the world. The model kit can be used by the architect to pass time and also understand the complexity of these buildings. 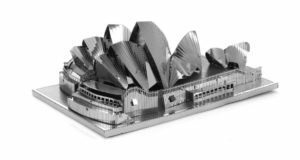 The model kit in the link contains the miniature model kit of Sydney Opera house. 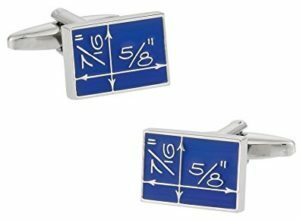 Cufflinks are used by professionals with formal shirts in place of cuff buttons. An architect will love anything about his profession and every project starts with a blueprint. The cufflink that I am referring here is a small replica of blueprint. The last one in the list of unusual gifts for an architect is a drone with GPS capability. You would be thinking why I included a drone in the list of presents for architects. 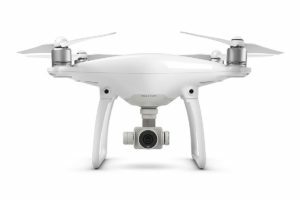 The drone in the link has camera that can capture 4K ultra HD video at 30 fps. You can control the drone using the smartphone. By gifting this drone, you give the architect the ability to capture architectural buildings from the sky.